Youth for Christ director Gavin Calver isn’t just passionate about seeing responses to the gospel, but seeing the prodigals return home. It’s why him and his wife Anne have written Stumbling Blocks – a new book dealing with reasons why people leave their faith behind. Gavin is angry at how the “nonsense” of prosperity teaching makes people believe that once you follow Jesus everything will be fine. “It’s just not true”, he says. Tackling specific issues, Gavin and Anne want to prevent Christians from falling away and help those who have lost their faith, rediscover God. Everything from over-familiarity with the church, to death and idolatry is covered. “We don’t want to deny the power of some of these experiences but we want to say it’s possible to get up and keep going,” Gavin explains. 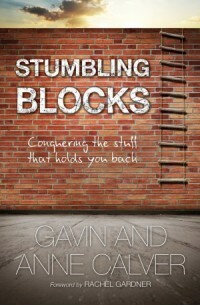 Keen to get the message out, Gavin encourages people to buy two copies of Stumbling Blocks - one to read themselves and one to give to friends. I agree. I think too many people these days forget that following Christ is hard work and is going to cost them, in terms of time, money and emotional commitment. In our Church we require new converts to be living the Law of Chastity before they are baptised, and to give up smoking, drinking, etc. Because if they can't live a righteous life before they are baptised, they're not going to be able to afterwards either.